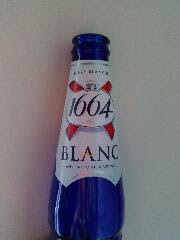 Kronenbourg 1664 is everywhere in France, and you can get them quite easily in NZ and Australia, too. But their white beer brand is very hard to find. In fact, I have at least two French friends of mine who swear it as the 'best beer in the world', and in the end I had to ask one of them to bring it over from France for me. While I am not sure about it being the best beer in the world, Kronenbourg blanc certainly is a refreshing alcoholic drink with a citrus-y note. More than the beer, though, I love the azur blue bottle! Can I please have some more?